Take a Step Back in Time at the quaint and rustic Woodstock Lodge, located on a scenic parcel of 6.5 acres and within walking distance to the charming village of Woodstock, NY. The Lodge includes 12 cabins and 28 cabin / lodge rentals, all functional for year-round guests. 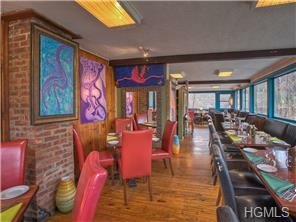 A vintage 40-seat restaurant and bar, outdoor pool, wooded walking trails on property. Year-round recreational pursuits make it a four-season destination — golf, ski, performing arts, festivals, shops and restaurants. Minor changes and aesthetic upgrades will bring this property to its full potential. For property details and photo tours – Click the link below! Piermont Events this month and next!